Men’s Stainless Steel Ring With Spiral Golden Wire Inlay | BUDK.com - Knives & Swords At The Lowest Prices! This handsome ring is both elegant and masculine and looks great on any man as a chic, modern wedding band or simply a stylish everyday fashion accent. The focal point is the spiral golden wire inlay - two fine, gold-colored stainless steel wires delicately intertwined and set in a center channel along the entire circumference of the band. This distinctive accent offsets the mirror-polished stainless steel beautifully and affords a refreshing, eye-catching play on the classic men’s band design. The ring’s stainless steel construction has a sheen and durability unmatched by more traditional ring materials - precious metals, ceramics and more. This ring is truly forged for a lifetime of vigorous wear, so you needn’t fear damage while fixing on a car, performing carpentry or other hands-on work. Available in sizes 9-12, we’ve got the perfect fit for any man. 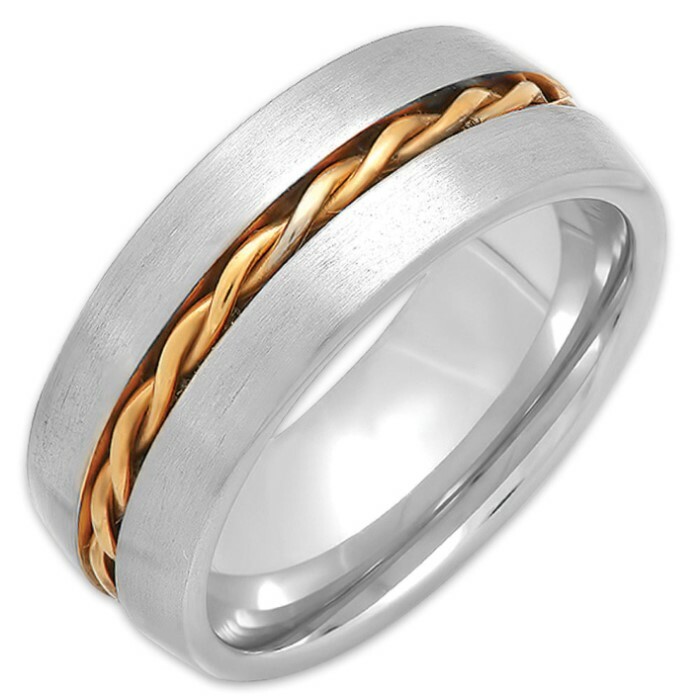 The Men’s Stainless Steel Ring With Spiral Golden Wire Inlay makes a fantastic gift, and you won’t find a better price on high quality jewelry like this anywhere else.